This package has been constructed and designed for those couple’s that simply want EVERYTHING! A choice of a hand selected 4* hotel complete with bed and breakfast in a one bedroom accommodation with full facilities available, or a Private Villa one of our own? 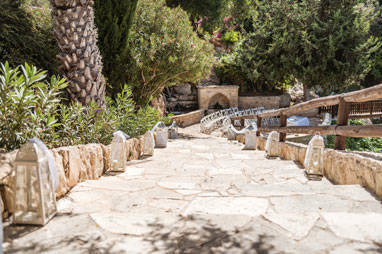 7 day stay complete with airport return transfer for the Bride and Groom. Arrangements and Administration of the special marriage license from the town hall or church if applicable. Booking of wedding date and time. 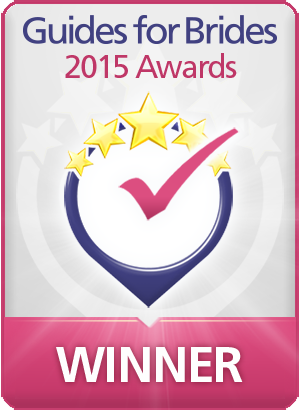 Full assistance throughout the planning period, including paperwork and legalities. 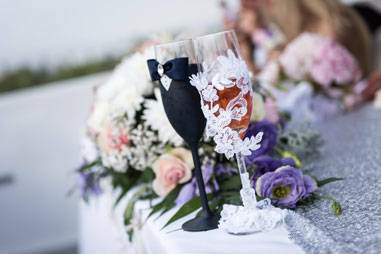 Personal Wedding Specialist throughout your wedding preparation and who will organise the ordering of flowers, photographer, videographer, transport, decoration, and timings of the same. Arrange all appointments necessary and where applicable. Collection to and from the Town Hall in resort, including assistance throughout your application for your marriage license, and the Church appointment (if applicable). A decorated convertible wedding car for the Bride from hotel to yacht/church/town hall in Paphos. A decorated convertible wedding car for the Groom from hotel to yacht/church/town hall in Paphos. A bridal bus choice of colours for your guests from the hotel to the port/church/town hall and return. A photographer for the entire day, from getting ready to the end of the party. 300 photos in high resolution carefully chosen by our professional photographer after some delicate retouches and a further 40 high resolution with artistic touches presented on a beautiful diamond heart USB in a white pouch. Full copyright and all printable. A videographer for the entire day from getting ready to the first dance fully edited to approximately 30 minutes with music. Hair and makeup for the bride (trials for the bride included). Deluxe bridal posy, Buttonholes for the groom, best man, and two fathers, corsages and wrist corsages for the two mothers. Two posies for the bridesmaids and one table decoration for the ceremony, plus an organza bag with fresh petals for the flower girl. All table linen to compliment the tables with white chair covers and organza bows for chairs. Glass vases with candles as arrangements on tables inside yacht. Red or White carpet at the entrance of the yacht, complete with lanterns and candles on either side. Mirrored cubes with fresh roses for the dining tables. 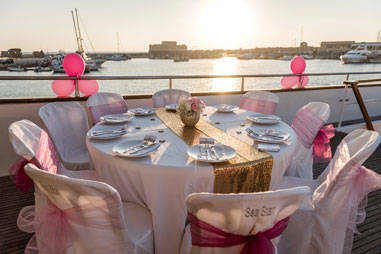 Wedding March or your own choice of song to welcome Bride on board. A DJ for the whole duration of the wedding reception. Fireworks display detonated from the aft of the yacht complete with themed music - includes license and fire officer. Full dinner buffet - Yacht Masters menu. 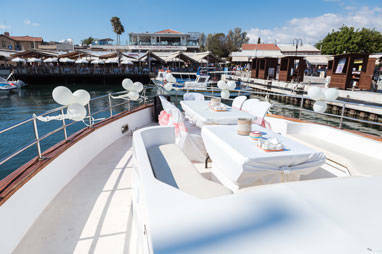 Reception of chilled Cyprus champagne, including canapés and open sandwiches with a variety of fillings. One tier iced sponge cake with butter cream swirl cupcakes (1 per guest). Unlimited local drinks from our fully stocked on board bar, consisting of beers, wines, spirits, cocktails, soft drinks, juices and water. 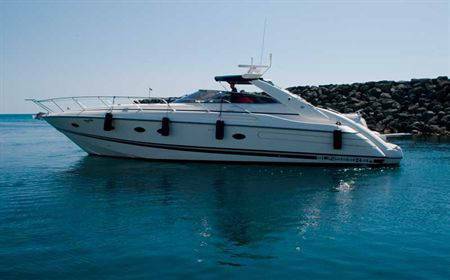 Cruise out to a bay, anchor for the party and return. Certificate of the Wedding Reception on board the yacht. Voucher to use on any cruise for up to two years maybe for your anniversary. Gifts from the company to take back home with you. €99 per child aged 3-12 years (under two year old are free). This price includes: Special marriage license and Marriage officer fees (civil). Please note there is a supplement for the Ocean Flyer €1,700. 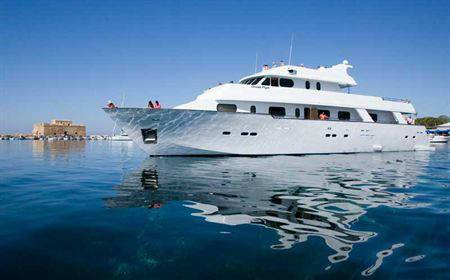 This price includes an overnight stay in the Honeymoon Suite, Moet & Chandon champagne, Continental Breakfast and scheduled cruise the following day. Arrangements and administration of special marriage license from the Town Hall or Church if applicable. 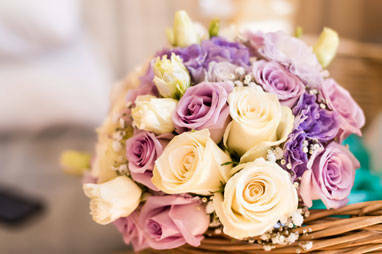 Personal Wedding Specialist throughout your wedding, who will organise your delivery of flowers, photographs and timings of all transport. 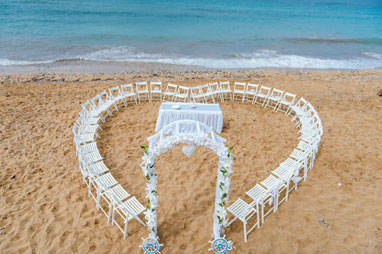 A personal itinerary of the day will be written in the resort with the bride and groom. 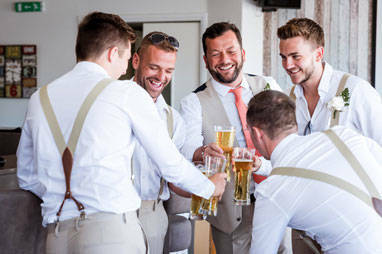 Full coordination of ceremony by one of our Specialists. 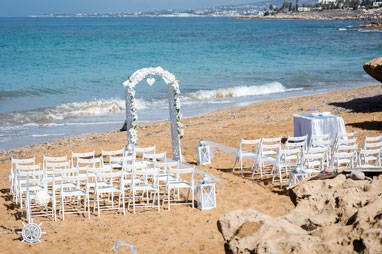 A decorated wedding car for the Bride up to 12 kilometres of Paphos. 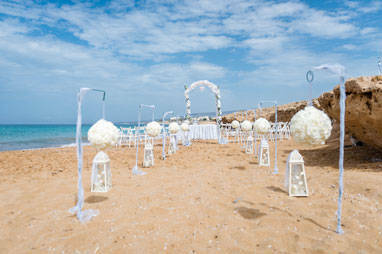 A decorated wedding car for the Groom up to 12 kilometres of Paphos. Hair and makeup for the bride including a pre-wedding consultation. Upgrade to have a trial hair-style before the day (small additional charge). Deluxe bridal posy, buttonhole for the Groom and the best man, corsages for the mothers with buttonholes for the fathers. Two posies for the bridesmaids and one table decoration for the ceremony, plus an organza bag with fresh petals for the flower girl. 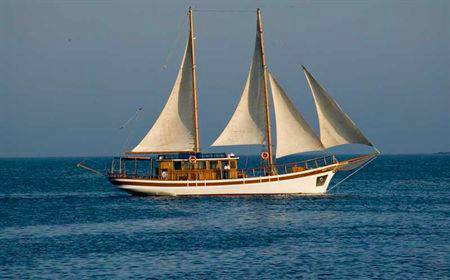 Fully decorated yacht with organza and ribbons. Glass bowls with floating gerberas on dining tables. Wedding march music or your own choice, played to welcome the bride on board. Cruise and return (cruise approximately: 2 hours fuel time). €65 per child aged 3-12 years (under two year old are free). 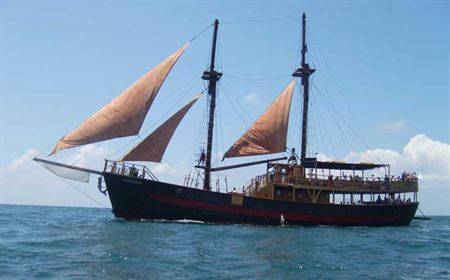 Please note there is a supplement for the Ocean Flyer €1700. 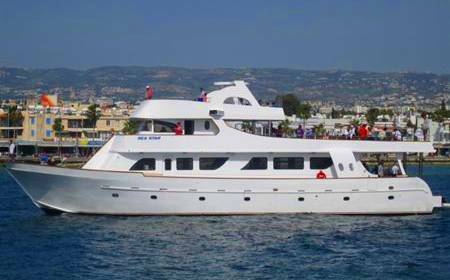 This price includes an overnight stay in the Honeymoon Suite, Moet & Chandon champagne, Continental Breakfast and scheduled day cruise the following day. 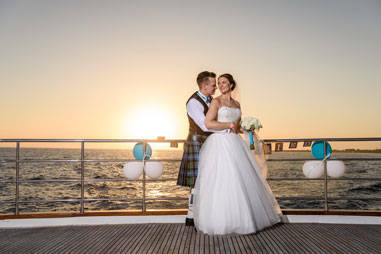 The Petty Officer's package includes all arrangements, administration of special marriage license from the Town Hall, booking of wedding date and time, confirming same. Full assistance throughout the planning period, including assisting of paperwork and legalities. 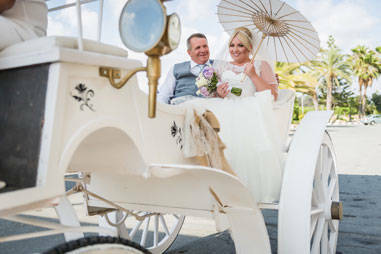 Collection to and from the Town Hall in resort, including assistance throughout your application for your marriage licence. 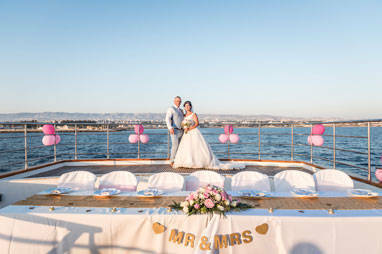 A decorated wedding car for the bride from the hotel to the port up to 12 kilometers. Upgrade to have a trial hairstyle before the day (small additional charge). Deluxe bridal posy, buttonhole for the groom and the best man, corsages for the mothers with buttonholes for the fathers. One table decoration for the ceremony, plus an organza bag with fresh petals for the flower girl. 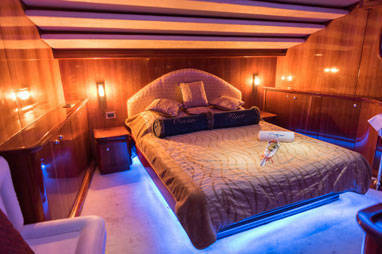 Glass vases with candles on tables inside yacht. One-tier sponge cake, fully iced. There is a charge of €95 per adult above these quantities of persons €45 per child aged 3-12 years (under two year old are free). Please note this package does not include Special Marriage License and Marriage Officer fees or Church fees. 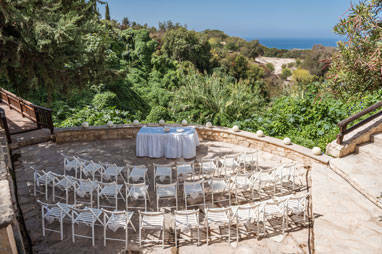 The Vrisi and Beach venues can seat up to 40 people and any more guests than that will need to be standing and there is an additional ceremony and venue charge of €499. ** Unlimited local drinks from our fully stocked on board bar, consisting of beers, wines, spirits, cocktails, soft drinks, juices and water can be purchased at €35 per person and half price for children. 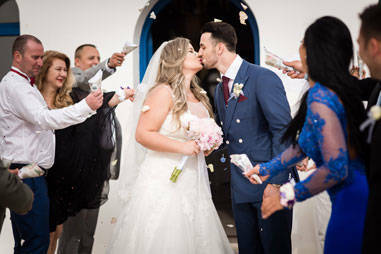 The Cadet's package includes all arrangements, administration of special marriage license from the Town Hall, booking of wedding date and time, confirming same. Full assistance throughout the planning period, including assisting of paperwork and legalities. 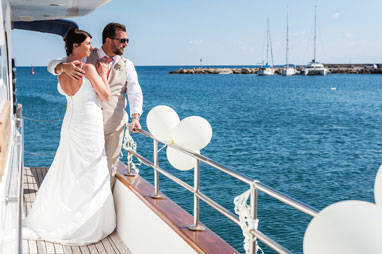 Personal wedding Specialist throughout your ceremony and arrival to the yacht. Collection to and from the Town hall in resort, including assistance throughout your application for your Marriage License. Cruise and return (cruise approximately 1 hour fuel time). €25 per child aged 3-12 years (two year olds are free). ** Unlimited local drinks from our fully stocked on board bar, consisting of beers, wines, spirits, cocktails, soft drinks, juices and water can be purchased at €30 per person and half price for children. You can also have this package on board the Ocean Flyer however please note that there is a supplement of €1700 payable for this vessel. 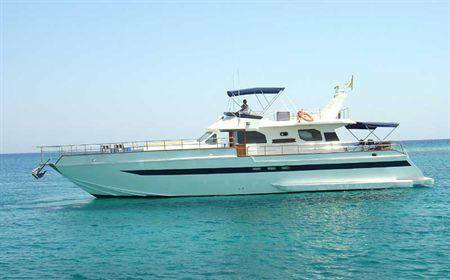 This price includes an overnight stay in the Honeymoon Suite, Moet & Chandon champagne, Continental Breakfast and scheduled day cruise the following morning. If you do not receive our email or it's attachement please check your spam folder, if you still don't seem to have our email please contact us and we will assist you further.